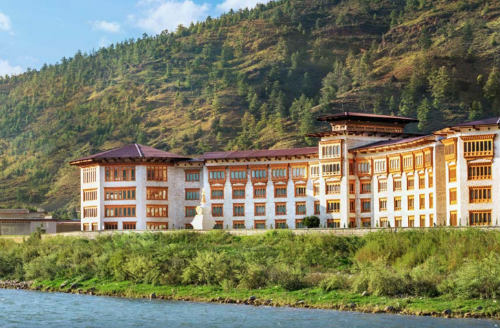 Bhutan Hotels can range from high-end 5-star luxury to the more homely 3 star, with a few 4 stars in between. The Kingdom of Bhutan was off-limits for tourists until the mid-seventies, and even today, very few tourists get to see its unspoilt interiors. Often called the last Shangri-La, Bhutan fiercely tries to hold onto its integrity and identity, allowing adventure lovers to bask in its mountain thrills while keeping culture vultures entertained with its traditional markets, monasteries, forts and idyllic way of life. Independent travel is not available, travel arrangements have to be made before arrival, so one of the best ways to explore Bhutan is through a travel company like Mystic India that has firsthand knowledge and the range of hotels we can suggest for your tour. 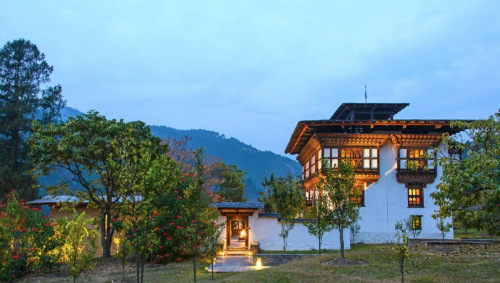 Bhutan hotels range from dramatic mountain retreats and high-end enclaves to homestays and remote lodges. Enjoying stunning views of snow-capped peaks, enchanting valleys and majestic forests from your hotel is all too common, and you are always left in awe of your surroundings, irrespective of the category of accommodation chosen. The country has its fair share of luxury hotels, with the Taj Tashi defining the magic and mystery that awaits you in this enchanted land. Charmed in Himalayan Heights, this stunning oasis brings Bhutanese art and tradition to life through its classical Buddhist murals and Dzong architecture. The hotel also presents some of the best preparations of the country’s rich cuisine while letting you gaze at stunning meadows and peaceful prayer wheels from its windows. For something more traditional, take a look at the Gangtey Palace, a 19th-century building that once used to host the Penlop of Paro. Its spacious rooms and antique pieces are sure to win you with their historic charm and those stunning garden and valley views are exactly what you want to wake up to. 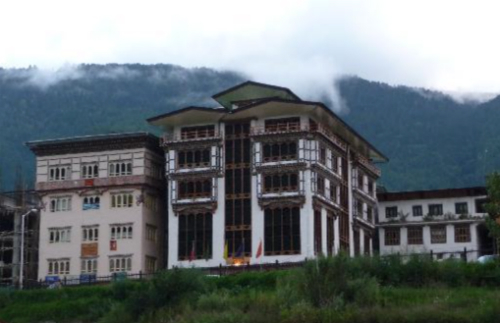 To find out more about the choice of hotels in Bhutan, get in touch with our travel advisors. Mystic India presents an exceptional collection of Bhutan hotels which cater to every need and suit every budget. 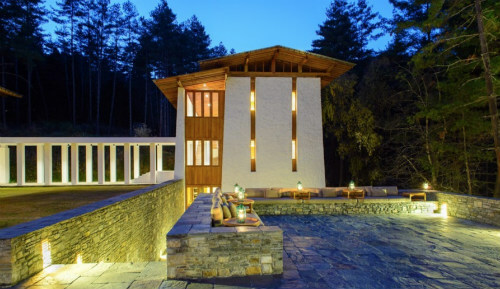 Aman Bumthang is just one of 5 lodges spread across Bhutan. Located in the Kingdom of Bhutan is a place of soaring 7,000-metre Himalayan peaks, glacial river valleys, and evergreen forests. Amankora comprises five lodges dotted across this ancient land. Paro, Thimphu, Punakha, Phobjikha and Bumthang. The hotel is designed and decorated in modern traditional Bhutanese style perfectly blended with the natural garden and apple orchard surroundings. The resort has 16 well furnished deluxe rooms with comfortable facilities for a perfect hideaway relaxation, as well as individual balconies to enjoy the breathtaking view of the valley. 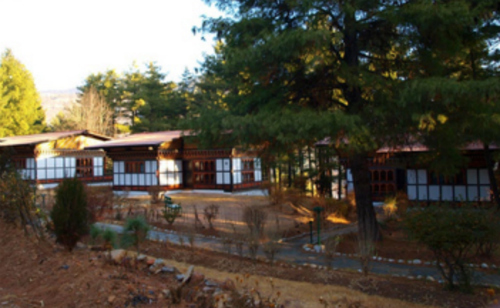 Gangtey Lodge offers a luxurious and interactive experience in Gangtey Valley and has done since it opened its doors in November 2013. 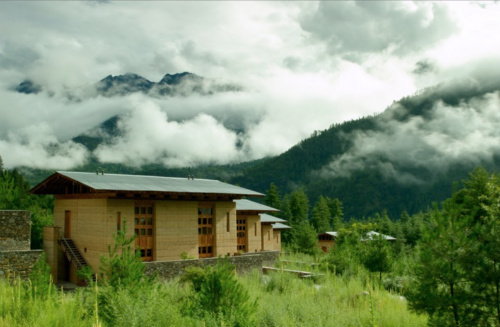 The Lodge draws upon the inspiration of the unique and beautiful Bhutanese rural architecture down to the very last detail. Designed by Mary Lou Thomson, who has worked on some of the world’s most prestigious resort projects, the interiors and furnishings showcase aspects of the vibrant local culture. About 3 kms from Paro, Hotel Olathang is perched atop a hill from where one can have a stunning view of the beautiful Paro valley as well as the pristine Paro River gurgling along its course. Connect yourself with nature at Hotel Olathang which is beautifully perched on a hill amidst 28 acres of blue pine forests and greenery. Le Meridien is a new hotel located right on the edge of the Paro River, and providing stunning views of Paro Valley, Le Méridien Paro, Riverfront is an ideal gateway for discovering the region’s charms, unique cultural heritage, and spectacular scenery. Looking for a hotel near Paro Airport, then the Tashi Phuntshok with its traditional Bhutanese architecture is centrally located in the beautiful valley of Paro right next to the airport, but as there are only a few flights a day the noise will not disturb you. It offers twenty-nine spacious rooms with private bathrooms. The essential amenities will give our guests a comfortable experience. The beautiful Bhutanese painting and panoramic view of rice fields are inviting features of this hotel. It has dining options and relaxing outdoor seating areas. 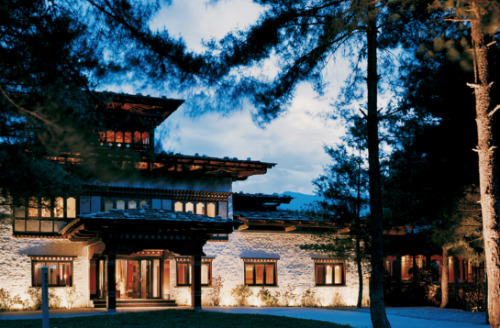 Uma Paro offers exceptional style in the Himalayan Kingdom of Bhutan. Reflecting an understated philosophy of quiet comfort in a unique, culture-rich location, this inland retreat is also dedicated to activity and adventure. 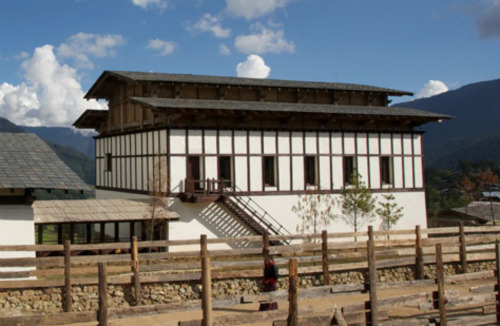 Damchen Resort is in Punakha, the old winter capital of Bhutan. It is reached from Thimphu through a series of zigzags over the Dochu La Pass, where one can on a clear day have a panoramic view of the eastern Himalaya, including Bhutan’s highest mountain, Gangkar Punsum, 24,770ft/7,550m. One can stop over a Lampere Park for a small picnic before the road drops down through varied forest finally emerging into the richly-cultivated Punakha Valley. 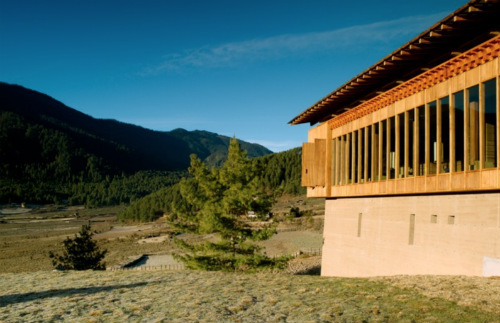 COMO Uma Punakha, our second hotel in Bhutan, is an intimate, luxury lodge located at the far western end of the lush Punakha Valley. 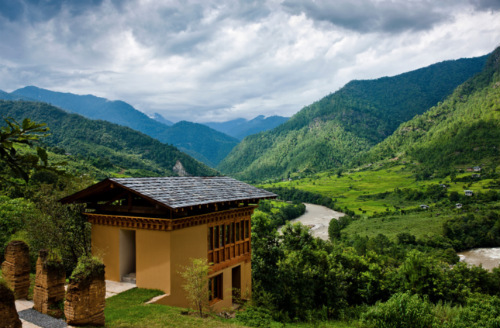 From our picturesque base overlooking a snake-like bend in the Mo Chu river, Uma Punakha is ideally located for those who wish to explore this remote Himalayan Kingdom. Located right in the heart of Thimpu city overlooking the national stadium where you may see Bhutanese archers clad in traditional Bhutanese outfits. 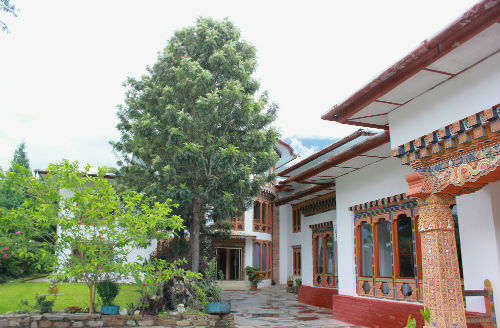 Kisa hotel is a unique blend of Bhutanese traditional and contemporary architecture. Enjoy Chili Cheese Ema datshi, the fiery Bhutanese delicacy at hotel’s traditional themed restaurant or simply relax at hotel’s bar or café. 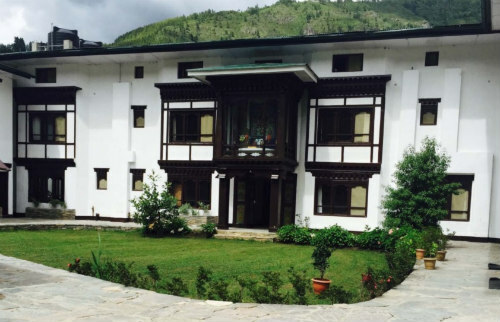 Aman Thimphu Lodge is just one of 5 lodges spread across Bhutan. Located in the Kingdom of Bhutan is a place of soaring 7,000-metre Himalayan peaks, glacial river valleys, and evergreen forests. 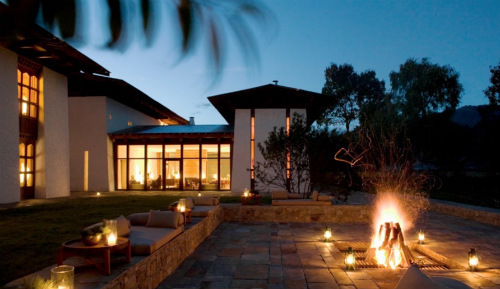 Amankora comprises five lodges dotted across this ancient land. Paro, Thimphu, Punakha, Phobjikha and Bumthang. 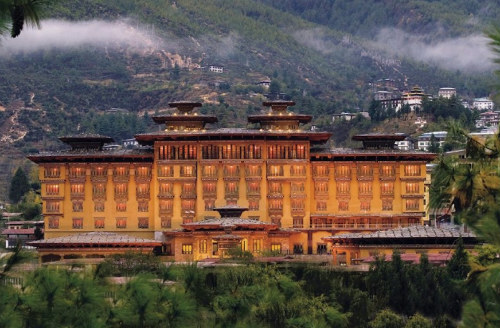 Set in the heart of the Thimphu Valley, the Taj Tashi, is a gateway to a land steeped in mythology and magic. The mountain kingdom of Bhutan remains one of the old world’s last few strongholds, as yet unspoiled by civilization. In the charmed isolation of the Himalayan heights, Bhutan’s ancient and alluring ways of Mahayana Buddhism continue richly intact to this day and permeate every aspect of Bhutanese life and art.